A few days ago we told you about the controversial and illegal geoengineering project that's already underway near Canada's Pacific coast. Some new details are emerging about the project — including insights which suggest that the Canadian government knew what was going on but did nothing to stop it. Just to recap, a private company called the Haida Salmon Restoration Corporation (HSRC), in conjunction with the controversial U.S. businessman Russ George, dumped 100 tonnes of iron sulphate into the Pacific ocean to capture carbon dioxide and create a plankton bloom that would restore fish populations. While it's fair to suggest that the First Nations people were motivated by environmental concerns, George is likely looking to profit by selling carbon credits. What makes this project particularly controversial is that ocean fertilization is in violation of two United Nations moratoria. Moreover, the HSRC and George acted unilaterally, using a technique that is scientifically unproven and potentially dangerous. But according to John Disney, the president of the HSRC, there was nothing secret about the project, nor does he feel that they have violated any laws. Speaking to the CBC, Disney said they had "carefully sprinkled" the dust onto the ocean in iron deficient areas. By doing so, they were hoping to bring the plankton biomass back to life because "everything was starving out there." The HSRC claims that the project is a success and that the ocean has responded as expected. According to Disney, the salmon have moved back in, along with whales, dolphins, porpoises, and birds. And to set the record straight, he said that the HSRC went to Russ George, and not the other way around as the Guardian reported. Moreover, he maintains that the HSRC was transparent about its intentions from the start, and that they were in touch with several international marine science organizations. Many of these groups, he says, supported the idea, who stated they were "waiting for someone to do this on a large scale." Disney also said that the latest effort was not the first, but the largest of over a dozen ocean seeding experiments to date. Shockingly, Disney claims that the HSRC has been in touch with the United Nations. He says they approved their small-scale iron fertilization scheme, but on the condition that they proceed with a "precautionary approach." Consequently, he insists that they've done nothing illegal. But given that the ocean fertilization is alleged to have affected an area 10,000 square kilometers (3,861 square miles) in size, it's hard to accept the claim that the recent project was "small-scale." Nor do their efforts appear "precautionary." Disney also claims to have been in touch with Environment Canada, its National Research Council, the Department of Fisheries and Oceans, and the Canadian Revenue Agency — and that their plan has "been on the radar for years." And in fact, Disney is currently preparing a report for Environment Canada about their latest effort. According to the Toronto Star, Environment Canada is now conducting an investigation. Canada's Minister of the Environment, Peter Kent, told the Star that, "If this (experiment) happened, it would be in violation of Canada's Environment Protection Act." But when asked if Environment Canada knew about the geoengineering experiment but did nothing to stop it, Kent refused to comment. If what Disney is saying is true, this could turn into a very large scandal for the Canadian government. Likewise, if the UN also knew, the scandal could get even worse. Not only is ocean fertilization illegal, it is also unproven. Back in 2009, an op-ed in Nature by several researchers warned about possible negative outcomes and side effects from large-scale iron fertilization. They were concerned, for example, that dead plankton could pull key nutrients out of the ecosystem. Biologist Victor Smetacek has stated that no large-scale fertilization should occur without further testing. And according to Maite Maldonado, a biological oceanographer at the University of B.C. who specializes in the impact of trace minerals on ocean life, the project could actually result in the reverse of what it was intended to do. Specifically, she worries that the lack of oxygen could potentially create toxic, lifeless waters. All this couldn't come at a worse time for Canada. Just yesterday the country was awarded the ignominious Dodo Award for ‘failing to evolve' and not taking the required actions needed to address biodiversity loss. 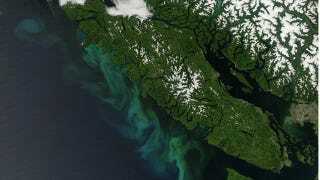 Top image: Tiny phytoplankton in the sunlit surface water west of Vancouver Island bloom when wind and surface ocean currents cause nutrient-rich deep water to rise to the surface. Via NASA Earth Observatory. Inset images NASA and here.